together. Usually these owners, who are more often than not male owners, play and wrestle with their dogs without the use of a toy. This type of mouthiness is the most common and the most easily fixed. When you play with your dog, you must always use a toy as a shared object of play. Playing any other way is only encouraging your dog to express their playfulness by using his mouth on your body parts, much like he would with another dog. So a toy gives your dog a sanctioned target for his mouth. It is a commonly held belief that playing tug with your dog will increase aggressive behavior. In fact, tug is cooperative in nature. It is an adaptation of part of a canid’s natural hunt sequence; in particular it is the way in which members of a pack would subdue, kill and dissect their prey. 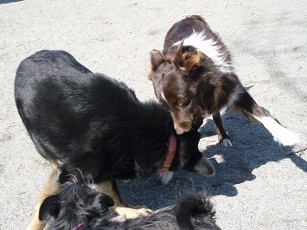 So, though there is a competitive aspect to the game of tug, some dogs may even handicap themselves, particularly when playing with a weaker playmate, such as a puppy, in the interest of prolonging the game. As dogs become more aroused, their behavior is more likely to deteriorate. They may start to jump on you, crash into you, or nip. To teach your dog how to better master his arousal levels, interleave play with control behaviors like sit or down before releasing him to play again. So, when playing fetch, as your dog returns with the ball, ask for a drop, then for a sit before throwing the ball and releasing him to retrieve it. In a game of tug, ask for a drop, then a down before releasing him to take the tug toy again. Over time, these games with rules will foster more respectful play habits. Dogs may use a host of behaviors, such as barking, whining, pawing, even nipping, in order to incite what they want, such as play, food or attention. First and foremost, nothing good should result from these bad behaviors. To acquiesce to the demand is to teach your dog that such strategies work. Instead, respond by clearly demonstrating that the object of his desire becomes less attainable, not more. So, for instance, if your dog badgers you to produce his dinner or to play with him, withhold attention, turn your back, even go as far as to leave the room to clearly communicate to him that his methods are not working. Only when he makes his requests by sitting and waiting quietly should you consider granting his wishes. So what should you do if your dog is mouthy? Some popular techniques are to hold the dog’s mouth shut or to tap him on the nose. In fact, depending on the dog, these are likely to provoke more mouthiness or, worse, an aggressive response. Instead, use a NRM (No Reward Marker) – mark the bad behavior with a firm “uh-uh!” and remove your hands out of reach. If the behavior continues, then give your dog a time-out. If all else fails, try applying something unpleasant tasting to your hands like Bitter Yuck or Tiger Balm. Hopefully your dog will learn that humans don’t taste very good and he’ll be less likely to take them in his mouth in the future. The best antidote to any undesirable behavior is training. Through training, you can establish appropriate behavior patterns, build your dog’s impulse control, and foster a respectful and loving relationship between you.